Why Did Khizr Khan Delete His Law Firm's Website? Peter Schiff: Time Is Running Out, "Crisis Worse Than 2008 Coming"
D-Day For Australia's Real Estate Bubble? WARNING!? SOMETHING BIG IS ABOUT TO HAPPEN World Wide in 2016? The last time we discussed America's B61 nuclear bombs, was in the aftermath of Erdogan's staged coup, after Turkey shut the power and suspended all operations at the local Incirlik NATO airbase, where over 50 of the same nuclear bombs are stored. Now it appears that particular nuclear bomb is about to get a long overdue facelift. According to a statement by the National Nuclear Security Administration, the Obama administration has given the go-ahead for work on upgrading the B61 airborne nuclear bomb, as the Pentagon is eager to embark on a multi-billion-dollar scheme to improve the US nuclear arsenal. 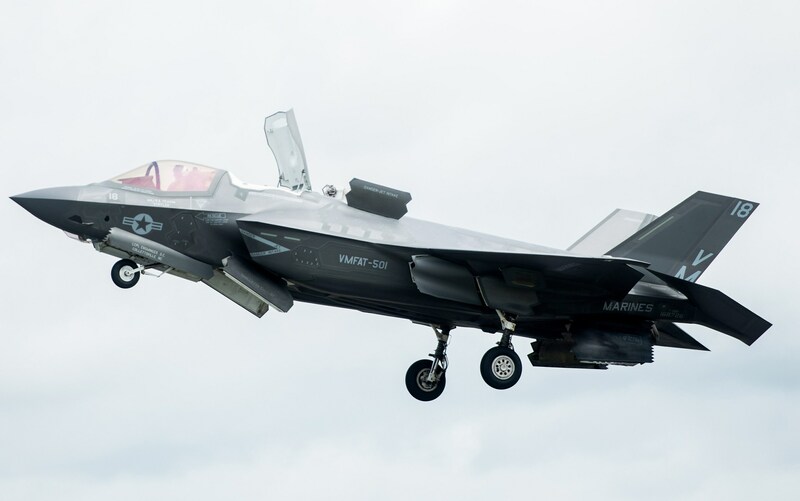 The decision by the NNSA authorized the program to enter a post-engineering phase, which comes after four years of work to, in technical terms, "preserve a critical element of the U.S. nuclear triad and the extended deterrent." As a result, the first upgraded bombs are set to roll out by 2020. The B61 has been the principal US airborne nuclear bomb since 1968, when the first version was commissioned. With some of the modifications being canceled over the years and others withdrawn from use, only models 3,4,7,11 and 12 are currently in active service. In the NNSA statement, Administrator Lt. Gen. Frank G. Klotz (Ret.) said that "Reaching this next phase of the B61-12 LEP is a major achievement for NNSA and the exceptionally talented scientists and engineers whose work underpins this vital national security mission." "Currently, the B61 contains the oldest components in the US arsenal. This LEP (life extension program) will add at least an additional 20 years to the life of the system," he added. "These life extension programs directly support President Obama's directive to maintain a safe, secure, and effective nuclear deterrent, while reducing the size of the stockpile," Secretary of Energy Ernest Moniz mentioned in the press release. "Once completed, the B61-12 LEP will allow for the retirement of the B83-1—the last megaton-class weapon in America's nuclear arsenal—while supporting the nation's continued commitment to our national security and that of our allies and partners," Moniz added cited by RT. While it is not exactly clear why the administration of a Nobel Peace Prize winning president would embark on a plan to modernize US nuclear weapons is unclear, but it is clear that it will cost a lot of taxpayer money: the project is expected to cost around $355 billion by 2023. However, critics say that this figure could rise to over $1 trillion in the future. Russia has been less than enthused by the US intention to modernize its nuclear arsenal. "The experts need to give their opinion about this," said Dmitry Peskov, President Vladimir Putin's press secretary. Senator Viktor Ozerov told RIA that Russia's nuclear scientists would be assessing the US plans and would take steps to tackle the proposed threat if it is deemed necessary. "No doubt, our nuclear weapons specialists will carefully study the level of threat and will take measures to minimize it, if needed," Ozerov said. No doubt, also, that Russia may itself doing the very same shortly after the US in what would mark the start of the second nuclear arms race in every possible way. Rob van Riet, the coordinator for disarmament program at the World Future Council foundation, told Sputnik that the decision is harmful to nuclear security and could lead to the weapons being used by accident, while it also "sends the wrong signal." "The decision to extend the life span of [or] modernize the system is an unnecessary one that comes at a sizeable price tag and does the opposite of advancing nuclear security and disarmament. These weapons are a remnant of the Cold War," van Riet said. Precisely: which is why many find the decision by Obama to greenlight this project confusing at best. The decision to prolong the life of the B61-12 also comes as the US Air Force announced that it is planning to move ahead with proposals to replace its current intercontinental ballistic missile and nuclear cruise missile with new programs. The Ground Based Strategic Deterrent (GBSD) will replace the Minutemen III ICBM, the Long Range Standoff (LRSO) weapons and the AGM-86B Air Launched Cruise Missile. Its backers say that the program is vital in helping to maintain the US nuclear deterrent. And the best news, if only for America's military-industrial complex: "This request for proposals is the next step to ensuring the nation's ICBM leg of the nuclear triad remains safe, secure and effective," Major General Scott Jansson, Air Force program executive officer for strategic systems, said in a statement cited by Defense News. This means that one or more corporations are about to make billions in profits just to make sure that the US preserves its pre-emptive and first strike capabilities, and can effectively and clinically destroy the world. It also means that taxes are likely about to go up again. The IMF’s Independent Evaluation Office (IEO) issued a report a few days ago entitled ‘The IMF and the Crises in Greece, Ireland, and Portugal’. It is so damning for managing director Christine Lagarde and her closest associates, that it’s hard to see, certainly at first blush, how they could all keep their jobs. But don’t be surprised if that is exactly what will happen. Because organizations like the IMF don’t care much, if at all, about accountability. Their leaders think they are close to untouchable, at least as long as they have the ‘blessing’ of those whose interests they serve. Which in case of the IMF means the world’s major banks and the governments of the richest nations (who also serve the same banks’ interests). And if these don’t like the course set out, a scandal with a chambermaid is easily staged. What the IEO report makes very clear is that the IMF should never have agreed, as part of the Troika, to assist the EU in forcing austerity upon Greece without insisting on significant debt relief, in the shape of a haircut, or (a) debt writedown(s). The IMF’s long established policy is that both MUST happen together. But its Troika companion, the EU, is bound by the Lisbon Treaty, which stipulates: “The Union shall not be liable for or assume the commitments of central governments”. Also, the ECB can not “finance member states”. If Lagarde and her minions had stayed true to their own ‘principles’, they should have refused to impose austerity on Greece if and when the EU refused debt relief (note: this has been playing out since at least 2010). They did not, however. The IMF caved in (how willingly is hard to gauge), and the entire Troika agreed to waterboard Greece. The official excuse for bending the IMF’s own rules was the risk of ‘contagion’. But in a surefire sign that Lagarde et al were not acting with, let’s say, a “clear conscience”, they hid this decision from their own executive board. One must wonder why the IMF has an executive board at all. Is it only to provide a facade of credibility and international coherence? When it becomes so clear, and -no less- through a report issued by one of its own offices, that its ‘boots on the ground’ care neither for its established policies nor for its board, isn’t it time for the board to interfere lest the Fund loses even more credibility? The IMF’s main problem, which many insiders may ironically see as its main asset, is the lack of transparency, combined with the overwhelming power exerted by the US and Europe. And Europe’s grip on the IMF is exactly what the report is about, in that it accuses Lagarde et al of bowing to EU pressure, to the extent that it abandons its own guiding ‘laws’. It acted like it was the European Monetary Fund, not the international one. So there’s no transparency, no accountability, and in the end that will lead to no credibility and no relevance. Well, that’s exactly how the EU lost Britain. And that shows where accountability and credibility are important even for non-democratic supra-national institutions, something these institutions are prone to neglect. No, there will not be a vote put to the people, no referendum on the IMF. Though that would sure be interesting. What can happen, though, is that countries, even large ones like China and Russia, threaten to leave, perhaps start their own alternative fund. These things have already been widely discussed. What is sure is that the US/Europe-centered character of the Fund will have to change. If Washington and Brussels try to appoint another European as managing director (an unwritten law thus far) they will face a rebellion. That next appointment may come sooner than we think. Because Christine Lagarde is in trouble. It’s even a bit strange, and that’s putting it gently, that she’s still in her job. What’s hanging over her head is a 2008 case, in which she approved a payment of €403 million to businessman Bernard Tapie, for ‘losses’ he was to have suffered in 1993 when French bank Crédit Lyonnais supposedly undervalued his stake in Adidas. Lagarde is accused of negligence in the case, in particular because she ignored advice from her own ministry (yeah, that does smack like the IMF thing) and let the Tapie case go to a special arbitration committee instead of the courts. That Tapie was a supporter of the Sarkozy government Lagarde served as finance minister at the time makes it juicier. So does this: In 1993 Crédit Lyonnais was a private bank. But in 2008, it had been wound up and was run by a state-operated consortium. Therefore, the €403 million ‘awarded’ to Tapie out-of-court was all taxpayers money. Even juicier: in December 2015, a French appeal court overruled the compensation and ordered Tapie to repay the money, with interest. What’s peculiar about Lagarde staying on at the IMF is that she is not merely under investigation or even ‘only’ accused of committing a crime. Instead, she has been ordered to stand trial, something she’s spent 8 years trying to avoid. Still, apparently nobody sees any problem in her continuing to act as Managing Director of the IMF. That is quite something. And it directly affects the Fund’s credibility. If a president or prime minister of a country, any country, had been ordered to stand trial, the likely procedure would be to temporarily stand down and let someone else take care of government business pending the trial. That’s perhaps what the IMF board are thinking too. Whether that’s wise remains to be seen. Hubris rules all these institutions, sheltered as they are from the real world. But the real world is changing. Ironically, many people think these changes will reinforce the IMF. Since the Fund can issue a sort of ‘super money’ in the shape/guise of Special Drawing Rights (SDRs), and especially China would seem to like SDRs becoming the world’s reserve currency instead of the US dollar, the IMF in some people’s eyes holds a trump card. There may well be an effort to hide private and public debt throughout the planet even more than it is hidden now, through SDRs. We’ll likely see governments and perhaps large corporations issue bonds denominated in SDRs. China seems to think that this could potentially halt much of its capital flight. My trouble with this is that it’s either too unclear or too clear who would profit most from such schemes. Even if the next managing director of the IMF is not European, but Asian or African, the puppet masters of the Fund will still be the same western financial ‘cabal’. And I don’t see China or Russia signing up to that kind of control, and willingly expand it by making SDRs far more important. Then again, there’s a sh*tload of debt that needs to be hidden, and the whole world is running out of carpet to sweep it under. Then again, Russia is not that indebted. It’ll be hard to get a consensus. But all that won’t help Greece. Let’s get back to that. We left off where Lagarde conspired with the EU, under the guise of preventing contagion, to abandon the IMF’s own rules in order to waterboard the country. Of course, we know, though nobody writing on the IEO report mentions it, that the contagion they were trying to prevent was not so much between nations but between banks. The bailout-related policies and actions that Lagarde hid from her own board (!) were designed to make French and German banks ‘whole’ at the cost of the Greek people. It became austerity, so severe as to make no sense whatsoever -certainly inside an alleged ‘Union’-, even if the IMF -not the world most charitable institution- has always banned this without being accompanied by strong debt relief. Schäuble and Dijsselbloem saved Germany and Holland at the expense of Greece. This will end up being the undoing of the EU, even if nobody’s willing to acknowledge it despite the glaring evidence of the Brexit. It will probably be the undoing of the IMF as well. And there I get back to what I’ve said 1000 times: centralization can only work in times of growth. There is no conceivable reason, other than dictatorship, why people would want to be part of a centralizing movement unless they get richer from it. In today’s shrinking global economy, we have passed a point of no return in this regard. Everyone will want out of these institutions, and get back to making their own decisions about their own lives, instead of having these decisions being taken by some far away board with no accountability. [..] In Greece, the IMF violated its own cardinal rule by signing off on a bailout in 2010 even though it could offer no assurance that the package would bring the country’s debts under control or clear the way for recovery, and many suspected from the start that it was doomed. The organisation got around this by slipping through a radical change in IMF rescue policy, allowing an exemption (since abolished) if there was a risk of systemic contagion. “The board was not consulted or informed,” it said. The directors discovered the bombshell “tucked into the text” of the Greek package, but by then it was a fait accompli. [..] The injustice is that the cost of the bailouts was switched to ordinary Greek citizens – the least able to support the burden – and it was never acknowledged that the true motive of EU-IMF Troika policy was to protect monetary union. Indeed, the Greeks were repeatedly blamed for failures that stemmed from the policy itself. This unfairness – the root of so much bitterness in Greece – is finally recognised in the report. “If preventing international contagion was an essential concern, the cost of its prevention should have been borne – at least in part – by the international community as the prime beneficiary,” it said. That would seem to leave the IMF just one option: to apologize profoundly to Greece, to demand from the EU that all unjust measures be reversed and annulled, and to set up a very large fund (how about €1 trillion) specifically to support the Greek people, including retribution of lost funds, repair of the health care system, reinstatement of a pension system that can actually keep people alive and so on and so forth. And to top it off of course: debt writedowns as far as the eye can see. You f**k up, you pay the price. This makes me think of a remark by Angela Merkel a few weeks ago, she said ‘we have found the right mix when it comes to Greece’. Well, Angela, that is so completely bonkers it’s insulting, and the IMF’s own evaluation office says so. [..] to complete this week’s drubbing of the troika, the report by the IMF’s Independent Evaluation Office (IEO) saw the light of day. It is a brutal assessment, leaving no room for doubt about the vulgar economics and the gunboat diplomacy employed by the troika. It puts the IMF, the ECB and the Commission in a tight spot: Either restore a modicum of legitimacy by owning up and firing the officials most responsible or do nothing, thus turbocharging the discontent that European citizens feel toward the EU, accelerating the EU’s deconstruction. [..] The question now is: What next? What good is it to receive a mea culpa if the policies imposed on the Greek government are the same ones that the mea culpa was issued for? What good is it to have a mea culpa if those officials who imposed such disastrous, inhuman policies remain on board and are, in fact, promoted for their gross incompetence? First on the list is Mr Poul Thomsen – the original IMF Greek Mission Chief whose great failure (according to the IMF’s own reports never before had a mission chief presided over a greater macroeconomic disaster) led to his promotion to the IMF’s European Chief status. A close second spot in this list is Mr Thomas Wieser, the chair of the EuroWorkingGroup who has been part of every policy and every coup that resulted in Greece’s immolation and Europe’s ignominy, hopefully to be joined into retirement by Mr Declan Costello, whose fingerprints are all over the instruments of fiscal waterboarding. And, lastly, a gentleman that my Irish friends know only too well, Mr Klaus Masuch of the ECB. You probably guessed by now that I would certainly and urgently add Christine Lagarde to that list of people to be fired. And not appoint another French citizen as managing director. Too risky. They do crazy things. The IMF must be reorganized, and thoroughly, or it no longer has a ‘raison d’être’. I see no reason to doubt that those who call the shots are too blinded by hubris to execute such measures, so I’ll list these things one more time: transparency, accountability, credibility and if you don’t have those you will lose your relevance. But it’s probably a bad idea to begin with to let an economy, if not a world, in decline, be governed by the same people who owe their positions to its rise. It would seem to take another kind of mindframe. But Value Walk contends that Kolanovic's conclusion is notable because it marks the first time central banks have been accused by an investment bank research report of "such direct market manipulation." Now that an analyst for JPMorganChase can admit it, could it be all right for mainstream financial news organizations to report it? 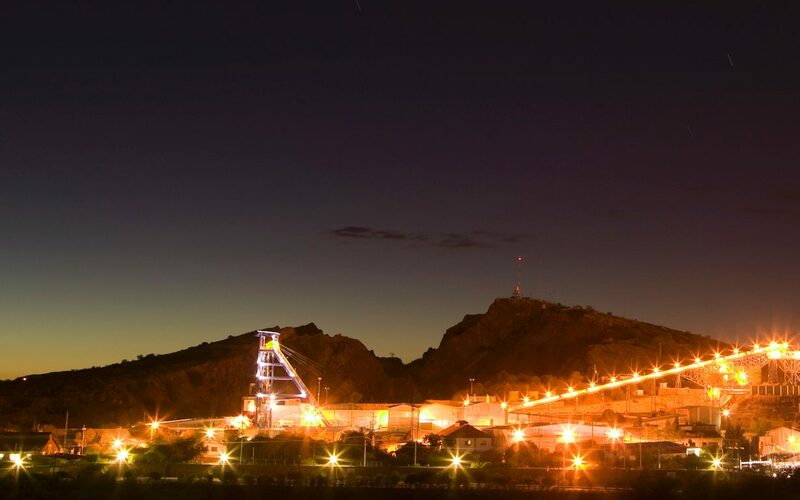 Aug 2 Fresnillo Plc's chief executive said the price of silver had bottomed, and added the miner would report a stronger core profit in the second half than the first if prices remained at current levels. Khizr Khan, the Muslim Gold Star father of Captain Humayun Khan, set off a media firestorm at the DNC last week when he criticized Trump for his "unconstitutional" policies aimed at banning Muslim immigration to the United States. A question posed by Breitbart is whether Khizr Khan's law firm, KM Khan Law Office, actually derives profit directly from Muslim immigration to the United States making him more than just an innocent conscientiousness objector to Trump's policy? It is widely acknowledged that the EB-5 program is riddled with flaws and corruption. Maybe it is only here on Capitol Hill—on this island surrounded by reality—that we can choose to plug our ears and refuse to listen to commonly accepted facts. The Government Accountability Office, the media, industry experts, members of congress, and federal agency officials, have concurred that the program is a serious problem with serious vulnerabilities. There are also classified reports that detail the national security, fraud and abuse. Our committee has received numerous briefings and classified documents to show this side of the story. The enforcement arm of the Department of Homeland Security wrote an internal memo that raises significant concerns about the program. One section of the memo outlines concerns that it could be used by Iranian operatives to infiltrate the United States. The memo identifies seven main areas of program vulnerability, including the export of sensitive technology, economic espionage, use by foreign government agents and terrorists, investment fraud, illicit finance and money laundering. More information about the EB-5 Immigrant Investor Program can be found on the Department of Homeland Security website. While it's unclear how this saga will play out, one thing we're pretty sure of is that we'll see a couple more days of related headlines before we finally get to put this to bed. Welcome to this week’s Market Wrap Podcast, I’m Mike Gleason. Coming up we’ll hear from Michael Rivero of WhatReallyHappened.com. Michael gives us his uncensored opinions on the recently concluded political conventions, why he sees this as a crucial election for the future of our Republic, and why he views precious metals as a must-own asset for the tumultuous times ahead. Don’t miss another fantastic interview with Michael Rivero coming up after this week’s update. Well, much to the dismay of Republicans and a great many Democrats, the Democratic National Committee formally put up Hillary Clinton to be the next President of the United States. Hillary’s coronation was met with boos, heckling, and walk outs by scores of rank and file Democrats. They believe, and with good reason, that their own party rigged the system on behalf of a crooked candidate. I read that I can't eat gold as I munched on my 401(k) sandwich and guzzled my IRA wine, which tastes like a cheap Chardonnay. For a side dish I ate blanched twenty dollar bills and consumed a chocolate money market for dessert. The point is that simple statements such as "You can't eat gold" are a useless DISTRACTION. Why would the financial powers-that-be want a distraction? If you store your wealth in gold, it is out of the fiat financial system and out of the control of bankers and politicians. They want control over your wealth and therefore they discourage ownership of gold. Simple! But there is more! Not only do bankers and politicians want control over your wealth, they also want control over the price of gold in the market. Gold competes with all other debt based fiat currencies, and banks, central banks, and governments promote and depend upon those fiat currencies. They don't want gold – a competing currency – attracting attention away from their heavily controlled fiat currencies. But central banks have only so much influence. In Japan the people are realizing they need gold, thanks to current central bank policies. "Precious metals markets have clearly turned the corner." The endgame for the U.S. economy is oblivion. 2008 was a minor correction compared to the eventual collapse of the U.S. Dollar. WHY: After the dot.com bubble burst in 2000, Fed chairman Alan Greenspan-led the Federal Reserve through a series of interest cuts that brought down the Federal Funds rate to 1% by 2004. The bubble created by those years of cheap Fed money at 1% resulted in U.S. households losing a total wealth of almost $14 TRILLION in the 2008 crisis. Stock markets fell by almost half for losing $7.9 trillion, and the housing market lost $6 trillion. FAST FORWARD TO TODAY: We’ve had 7 years of interest rates at 0%. As a result, there is more than just a housing bubble this time. There’s a stock bubble, a housing bubble, a bond bubble, a student loan bubble, and I could go on. As Peter explains, the Fed only has ONE option at this point: Continue to fake it for as long as possible by printing more money (otherwise known as “quantitative easing”), or let the whole system come crashing down. Donald Trump and Hillary Clinton’s acceptance as Republican and Democratic parties’ nominees for President sets the stage for the contest to begin in earnest. Both Trump, who is 70, and Clinton, who is 68, were born in the post-war Baby Boom era. So were their vice-presidential back-ups, Mike Pence and Tim Kaine, as well as all U.S. presidents since Bill Clinton. Gold investors thus need to consider the implications of a member of one of the most delusional, spendthrift, and amoral generations in history, occupying the White House for another four years. In their youth, Boomers, who were born between the mid-1940s and the early 1960s, stated loudly that they wanted to be nothing like their parents before them. Not surprisingly, the records of U.S. leaders from the Boom generation have been disastrous. Starting with Bill Clinton, through George Bush the Younger (who though born in 1943 was a child of a returning WW II veteran) and Barack Obama, Boomer presidencies have been characterized by increased government spending, borrowing, and money printing. More recently, they have introduced a new innovation: perpetual war. Produce phony numbers (unfunded liabilities, off-balance sheet debts, massaged government statistics). Trump’s personal financial statements, which suggest that his personal brand name alone (excluding real assets) is worth more than $3 billion, provide a taste for what is in store. Extend and pretend, refusing to deal with current problems, ranging from insolvent financial regimes, bankrupt pensions and healthcare systems to climate change, but instead passing on the growing problems to their successors. Baby Boomer presidents have all acted on the belief that there is no problem that cannot be solved by more government. The Clinton Administration was one of the first to use off-balance sheets liabilities in a material way, to disguise the unsustainable costs. George Bush the Younger nearly doubled the national debt and Barack Obama did so again. Both Trump and Clinton look set to instigate continued government spending increases when they take office, this time financed with an innovation suggested by another Baby Boomer Ben Bernanke: helicopter money. These include George W. Bush (who avoided Vietnam by using family connections to get assigned to a National Guard unit, where he could get pilot lessons for free). Bill Clinton ducked military service by studying in England. Hillary Clinton was able avoid active duty because she was a woman. Donald Trump ducked out by getting a medical deferment. In office, both Trump’s and Clinton’s avoidance of military service will put enormous pressure on them to “look tough.” Both will almost certainly buckle to such pressure. Clinton, for example, who in her early days on the scene was regarded as a dove, has been forced by political pressure to actively support almost every military action that the U.S. has ever undertaken. Both Trump and Clinton presidencies thus look set to continue favor the “Empire of Illusion” policies described by Hedges. Under either’s stewardship, unless things change, Boomers will cap a dubious performance: they will be the first generation in U.S. history to leave behind a weaker country than the one they inherited. In that climate, investors’ priorities need to be to minimize the damage to their portfolios. Return of investment, rather than return on investment, needs to be the main focus. A sound investment strategy, in such an environment, would almost certainly be overweight in hard assets, which are grounded in the reality-based community. Today I am battling technology & losing. What I affectionately call our Redneck WiFi got hit by lightning in a morning storm, & so my email and internet were knocked out. Must go fast because the evil spirits who seized my computer at work seem to have gotten ahead of me here at home in my laptop. Hope I can make a commentary work. TODAY was a bad day for stocks. Dow fell 90.74 to 18,313.77 (down 0.49%) & the S&P500 fell 13.81 (0.64%) to 2,157.03. That plunges them through the 20 day moving average & the top boundary of a megaphone. In other words, today stocks crossed the line, headed down. US dollar index tanked today, down 76 basis points to 94.99. This sent the Euro up 0.6% to $1.1228 and the yen up 1.53% to 99.13. That happened in the teeth of Bank of Japan announcing more inflation/stimulus. Whole world is nuttier than a ten dollar fruitcake. A deadly sickness has taken currencies. Gold & silver both made new highs for their move. Silver added 20.1¢ (1%) to 2066.6¢. Comex gold rose $13.00 (1%) to 1,364.40. Silver price runs into its upper channel boundary about 2100¢, & the last (early July) high was at 2122.5¢. A close above that will signal silver has pulled on its seven league boots & is fixin' to step OUT. Gold is challenging that last high at $1,377. Every know it all parvenu futures trader is shorting gold here, so that's slowing it down. But once it smashes that boundary, 'twill in short order leap for $1,450. After that comes a correction. Currencies have me biting my lip. Something is wrong, wrong there. Some bad message is coming through, some unexpected bad news. Or else I just don't get what's happening cause I'm only a nat'ral born durn fool from Tennessee. Aurum et argentum comparenda sunt -- -- Gold and silver must be bought. © 2016, The Moneychanger. May not be republished in any form, including electronically, without our express permission. To avoid confusion, please remember that the comments above have a very short time horizon. Always invest with the primary trend. Gold's primary trend is up, targeting at least $3,130.00; silver's primary is up targeting 16:1 gold/silver ratio or $195.66; stocks' primary trend is down, targeting Dow under 2,900 and worth only one ounce of gold or 18 ounces of silver. US $ and US$-denominated assets, primary trend down; real estate bubble has burst, primary trend down. Do NOT use these commentaries to trade futures contracts. I don't intend them for that or write them with that short term trading outlook. I write them for long-term investors in physical metals. Take them as entertainment, but not as a timing service for futures. This rotting shack in Sydney and its tiny plot of land sold for nearly $1 million in May of 2014 – more than two years ago. Since then, house prices in Australia have increased even further. Yes, it is an insane bubble, no doubt about it. As every seasoned market observer knows though, the fact that a bubble has obviously attained crazy proportions does not mean it cannot become even crazier. We only need to think back to the Nikkei index in the late 1980s, the Nasdaq in the late 1990s, or the grand-daddy of modern-day bubble insanity, the Souk Al-Manakh bubble in Kuwait in the early 1980s. The latter example is generally less well known than the others, but it is unsurpassed in terms of sheer mass dementia. What made this bubble so special – at its peak Kuwait’s stock market had a total capitalization of more than $100 billion, which made it the third-largest equity market in the world behind the US and Japan at the time, a fact that should have told market participants they were skating on very thin ice – was the use of post-dated checks to pay for stock purchases. The bubble needed a trigger to pop, and that trigger was delivered when one day, a single one of these post-dated checks actually bounced. One of the biggest market crashes in history ensued – a truly dramatic wipe-out, that in the end destroyed the country’s entire OTC stock market. As we have pointed out previously, while residential real estate is actually a consumer good, analytically it should be treated as akin to a capital good maintained over several consecutive stages of production, as it renders its services over a very long period of time (the same principle holds for other durable goods – see J.H. de Soto, Money, Bank Credit and Economic Cycles). One implication of this is that interest rates are very important to the valuation of real estate. At present, the administered central bank interest rate in Australia is at a new low, and since it remains actually high compared to similar rates in other developed countries, it may well decline even further. Australia’s administered central bank interest rate – click to enlarge. Gross market rates all over the world have so far continued to follow the downtrend in central bank rates, so the market has yet to reassert itself (we plan to post an in-depth discussion of the current trend in gross market rates soon). As long as rates remain low, real estate bubbles tend to remain well supported. Let us not forget, the bursting of a number of housing bubbles in 2006-2009 (in the US, Spain and several other countries) was preceded by a slow but steady increase in interest rates and a sharp slowdown in money supply growth in the major currency areas. Neither one nor the other are in evidence in Australia at present – at least not yet. Australia’s narrow money supply M1 has grown sharply in recent years (the pace of the advance is comparable to the pre-2008 era) – click to enlarge. One of the reasons why interest rates are so important in keeping residential real estate bubbles from imploding is that they make otherwise unaffordable properties seemingly affordable. Most home buyers use mortgages to finance house purchases, and the size of the monthly payment is therefore a main criterion in terms of affordability. Given that these are usually very long term loans with terms ranging from 15 to 30 years, the level of interest rates makes an enormous difference. Below is a slightly dated chart via Variant Perception (ending in Q2 2015) that compares Australian home prices, household incomes, rents and construction costs. It should be obvious how irrational house prices have become in light of the huge gap that has opened up between these time series. The chart also demonstrates that low interest rates are indeed of overwhelming importance in sustaining these sky-high prices. There is certainly little else that will. Australia: house prices vs. household income, rents and construction costs. Keep in mind though what we have mentioned in the annotation to the chart of Australia’s money supply above. The credit expansion that has been the driving force of the bubble has largely been the work of commercial banks. While the central bank has enabled them to offer loans at lower and lower rates, it is their willingness to actually do so that is decisive. Another chart illustrating the importance of interest rates to Australia’s housing bubble: the share of “interest only” mortgage loans, the principal of which is settled with a balloon payment at the end of their term. The influence of rates on the size of the monthly payment is even greater in these cases. One of our readers has recently made us aware of a recent development that may well throw a major spanner into the works. Similar to what has happened in other desirable destinations, Chinese buyers have played an increasingly important role in Australia’s property market. They have been especially active in the market for condominiums, which has experienced an extremely pronounced boom as a result. What we were hitherto not aware of was the extent to which these buyers have actually obtained financing from Australian banks. This source of funding is now threatening to dry up. The banks are pulling back after learning that many of the loan applications seem to be fraudulent. This happens to coincide with a noticeable surge in supply in the market – many developments that have been started in order to cash in on the huge gap between prices and construction costs are now finished or about to be finished (we can picture a great many “ghost apartment blocs” in Australia’s future). “Off-the-plan buyers of Australian apartments are in crisis as tough new borrowing rules mean thousands of investors who have paid a deposit are struggling to complete their purchases, according to local and overseas mortgage brokers and financiers. Shanghai-based financiers claim their Chinese clients’ funding from Australian banks has been frozen and they face foreclosure – or usurious interest rates – from private financiers. Australian financiers claim their local clients, many of them Asian, have had their settlements deferred by three months to find alternative funding. Mr Yin said this represented nearly 100 per cent of his clients who were waiting for properties to be completed in Australia and that most of the apartments were in the Melbourne CBD. Billions of dollars has been invested in tens-of-thousands of high-rise apartments that are reshaping the skylines of the nation’s major capitals, particularly Melbourne, Sydney and Brisbane. Most have been sold off-the-plan, which means purchasers buy off the blueprint with a deposit and complete when it is built, which requires a second valuation and financing commitment by the lender. But a huge increase in supply has slowed demand, particularly around Melbourne’s CBD, pushing down prices. Lenders, which initially fell over themselves to finance overseas’ buyers, slammed on the breaks when spot checks on the loan applications detected widespread fraud. The main problem is mainland Chinese buyers, which account for about half of the deals. That means many local lenders that agreed to provide funding when buyers made deposits, will not recommit upon completion. Nervous local lenders fear that a sharp downturn, or change of sentiment, could result in foreclosures with overseas borrowers they have little chance of locating. Mortgage brokers, who receive their commissions upon final completion, are nervous they will not be paid for negotiating deals and financing. Developers, some of whom have already canceled projects, are concerned about financing existing and future projects. It also has potentially big economic impact for local consumer sentiment, building services and government revenues. Overseas financiers, typically based in Singapore and Malaysia, are working on rescue packages for borrowers by creating private bail-out funds, or buying apartments off stressed purchases, which means they lose their deposit. They include rolling five-year terms, starting at 7.5 per cent, or one-year emergency loans at 12 per cent, according to financiers. Other packages are stepped-loans where the different amounts of the loan have different rates, invariably several times higher than Australian lenders’ standard variable or fixed rate loans. For example, Australian banks and other local lenders are offering three-year fixed rates at below 4 per cent. Home Tree Group’s Mr Yin said so far he was unable to secure funding for his clients and doubted they would be able to settle. “I have now stopped dealing in Australian property,” he said. Another agent in Shanghai, the chief executives of Iron Fish China Lanny Xu, said while most of his clients were not affected by the change, around 20 per cent were trying to on-sell apartments as they were unable to complete settlement. He said of some were looking to banks in Singapore for financing, as they were still happy to extend loans over Australian property. “The cost of funding in Singapore is higher than in Australia,” he said. Mr Xu said another option was to seek finance from newly established mortgage funds, which were looking to fill the gap left by the withdrawal of Australian banks from the market. He said such funds were charging interest rates of between 8 per cent and 12 per cent. In other words, a number of buyers are now faced with a sudden increase in interest rates from 4% to between 8% to 12% – regardless of the administered interest rate of the RBA. It is of course possible that the effect will once again stay local (i.e., confined to Melbourne and condominiums), similar to what happened when commodity prices collapsed. The downturn in commodities led to sharp declines in property prices in regions and towns close to mining activities. However, house prices in the big cities continued to soar – not least because the RBA cut rates in order to offset the impact of the commodities bust. It is definitely possible though that this latest development is actually the pin that finally pricks the bubble. As noted above, in Kuwait a single bounced check reportedly triggered an avalanche. The Souk Al-Manakh bubble is certainly not directly comparable to Australia’s housing market, but when a bubble is already very stretched, something will eventually trigger its demise – at times it can even be a seemingly small event. Condominium high-rises in Melbourne – to date the consensus was that the market “might” be oversupplied by 2018 – it appears as though this juncture has been brought forward. It is a very good bet that many of the condominium high-rises built in anticipation of ever-growing demand and an unimpeded expansion of bank credit will turn out to have been unwise investments. As Ludwig von Mises reminds us in Human Action, these malinvestments become visible once the banks are getting cold feet and are beginning to pull back – which is precisely what seems to be happening in this case. The breakdown appears as soon as the banks become frightened by the accelerated pace of the boom and begin to abstain from further expansion of credit. The boom could continue only as long as the banks were ready to grant freely all those credits which business needed for the execution of its excessive projects, utterly disagreeing with the red state of the supply of factors of production and the valuations of the consumers. These illusory plans, suggested by the falsification of business calculation as brought about by the cheap money policy, can be pushed forward only if new credits can be obtained at gross market rates which are artificially lowered below the height they would reach at an unhampered loan market. It is this margin that gives them the deceptive appearance of profitability. The change in the banks’ conduct does not create the crisis. It merely makes visible the havoc spread by the faults which business has committed in the boom period. It is probably still fair to say though that an outbreak of caution on the part of lenders is a trigger for the bust, in the sense that the illusory accounting profits generated during the boom period will suddenly disappear. Of course it remains to be seen if this recent development will have wider implications for Australia’s real estate bubble or if the central bank’s loose monetary policy will continue to trump such disturbances in the farce. This is one development though which the RBA cannot really influence – it is essentially a major rate hike affecting an important group of buyers, and it seems as though a lot of hitherto anticipated demand simply won’t be there. Two recent news stories highlight how pernicious the welfare state has become in America today. The first was an announcement by the feds that food stamps can be used to have groceries delivered right to a recipient’s door. Service with a smile. The Obama administration says it is too much of a hardship for those on welfare to actually travel to the grocery store. What’s next? Cooking the meal for them? If only the DMV would do home deliveries for drivers licenses. The second story was about the hullabaloo over a proposal by Maine governor Paul LePage to prohibit food stamp recipients from using their food aid to purchase junk foods like sugary soft drinks and candy bars. He says that the state has an obesity problem and he will “implement reform unilaterally or cease Maine’s administration of the food stamp program altogether.” The Obama administration rejected his request and the left activists act as if the idea that a welfare recipient can’t buy a pint of Ben and Jerry’s ice cream at taxpayer expense is a violation of civil liberties. The welfare/entitlement state of mind has spiraled out of control in America. No one is lifting a finger of opposition. The cost of welfare is now well over $1 trillion a year. Food stamps are so ubiquitous that they have replaced dollars as the new standard currency in many inner cities in America. Even in affluent areas with upscale grocery stores, food stamp recipients fill their carts with everything from cakes to lobster. Liberals love welfare. It was only a few years ago that Democratic House leader Nancy Pelosi opined that putting more people on food stamps and unemployment insurance is one of the “best ways to stimulate the economy.” Which is more astonishing? That she believes this lunacy or that she would be dumb enough to say it out loud. We are in the seventh year of a so-called recovery, yet 45 million Americans depend on taxpayers to put food on their table. This is roughly 5 million more than when President Obama took office. Medicaid rolls have exploded by more than 10 million, too, and Mr. Obama openly boasts about how many people he’s moved into the program. Unemployment insurance beneficiaries have fallen, thankfully, but the number of Americans collecting disability has continued to climb. Wow this is some recovery. By the way, disability rolls are growing even as worker safety has hit an all-time high. Shouldn’t safety and automation mean fewer disabled workers? The reality, as everyone in the welfare industry knows, is that food stamps and disability are the new welfare. Neither one of them requires work in exchange for benefits. No one wants to admit that the ease of entry into the welfare state and the generosity of the benefits is one big reason why labor force participation has collapsed. Why work? Welfare expert Peter Ferrara notes that a big instigator for the welfare state expansion has been the decimation of welfare reform laws passed in 1996. “It’s infuriating that a law that worked incredibly well in lowering costs and getting the unemployed into the workforce, has been largely gutted,” he concludes. As a result, the Census Bureau tells us that most families that are in poverty have no one working. Poverty is still widespread in America not because wages are too low, but that fewer poor people have a job. If there are no wages earned at all, it is impossible to get out of the poverty trap. Welfare incentivizes non-work in many other ways. Former George W. Bush economist Larry Lindsey reports that welfare recipients generally lose at least 50 cents of every dollar benefit they gain in wage and salary from working. Sometimes the benefits fall by 70 cents per dollar earned. So a $12 an hour job returns as little as $4 an hour of extra income. Why work? Democrats in Congress have vociferously opposed putting even baby teeth back into work for welfare requirements. Even modest workfare requirements are denounced as anti-poor. So even a proposed federal law mandating work for food stamp recipients who are non-disabled adults without kids got shot down. We know that changing welfare laws can have a very positive impact on getting recipients back into the workforce and off welfare. In North Carolina when unemployment benefits were reduced and the number of weeks of benefits were limited, entry into the workforce shot up. Entry into the workforce grew by more than nearly any other state in the country. Go figure. In Maine, we saw a similarly remarkable result from work requirements. According to a Heritage Foundation report: “SNAP recipients in Maine totaled 201,151 in April of 2015 — a decline of more than 28,000 in just one year. The number of ABAWDs — Able-Bodied Adults Without Dependents — in Maine declined about 80 percent” to 2,530 in 2015 from 12,000 prior to the work requirement. This result was in line with the federal work for welfare requirements enacted in 1996. Caseloads fell by more than half and costs of aid tumbled. So why aren’t Republicans pushing workfare for all federal welfare recipients? Some are afraid that they will be viewed as hard-hearted or even cruel. But getting people off of welfare into a productive job is not just a way to reduce costs, it’s a proven way to rebuild broken lives and move people into the mainstream. There is dignity in work. There is despair in welfare. After three generations of the failed entitlement state, hasn’t welfare done enough harm to the very people it was supposed to help. This post How Governments Can Kill Cash appeared first on Daily Reckoning. The global elites are using negative interest rates to do the same thing as inflation — make your money disappear. One way to avoid negative interest rates is to go to physical cash. In order to prevent that option, the elites have launched a war on cash. The war on cash has two main thrusts. The first is to make it difficult to obtain cash in the first place. U.S. banks will report anyone taking more than $3,000 in cash as engaging in a "suspicious activity" using Treasury Form SAR (Suspicious Activity Report). The second thrust is to eliminate large-denomination banknotes. The U.S. got rid of its $500 note in 1969, and the $100 note has lost 85% of its purchasing power since then. With a little more inflation, the $100 bill will be reduced to chump change. The war on cash is old news, but there are new developments. This May, the European Central Bank announced that they were discontinuing the production of new 500 euro notes (worth about $575 at current exchange rates). Existing 500 euro notes will still be legal tender, but new ones will not be produced. This means that over time, the notes will be in short supply and individuals in need of large denominations may actually bid up the price above face value paying, say, 502 euros in smaller bills for a 500 euro note. The 2 euro premium in this example is like a negative interest rate on cash. Why are central banks like the ECB imposing negative interest rates? What is the point of this policy? The whole idea of the war on cash is to force savers into digital bank accounts so their money can be taken from them in the form of negative interest rates. An easy solution to this is to go to physical cash. Yet if physical cash becomes scarce (or nearly worthless due to inflation), savers may pay a slight premium for large-denomination notes. Your premium disappears because the note pays no interest. The elites have actually figured out a way to have negative interest rates follow you from digital accounts to paper money. Negative interest rates are a thinly disguised tax on savers. The traditional way of stealing money from savers is with inflation. You may get a positive interest rate of 2% on your money, but if inflation is 3%, then your real return is negative 1%. If we take the same €100,000 bank deposit in the example above and apply a 2% positive interest rate, you would earn €2,000 in interest, leaving an account balance of €102,000 after one year. But after adjusting for 3% inflation, the purchasing power of the €102,000 balance is only €98,940. This leaves the saver worse off than in the negative interest rate example above (assuming no inflation in that case). In the first case, the banks extracted €500 through negative interest rates. In the second case, they extracted €1,060 in lost purchasing power. Any way you look at it, you lose. That's the reality. The second answer is the academic theory behind negative interest rates. In theory, savers will be dissatisfied with NIRP and react by spending their money. Likewise, entrepreneurs will find negative interest rates attractive because they can borrow money and pay back less to the bank. This combination of lending and spending by consumers and entrepreneurs alike will lead to consumption and investment that will stimulate the economy, especially after the famous Keynesian "multipliers" are piled on top. This theory is junk science. The reality is the opposite of what the elite academics project. The reason savers are saving in the first place is to achieve some future goal. It could be for retirement, children's education or medical expenses. When negative rates are imposed, savers don't save less; they save more in order to make up the difference and still meet their goals. The other unintended consequence of NIRP is the signal it sends. Savers rightly conclude that if central banks are using NIRP, they must be worried about deflation. In deflation, prices drop. Consumers defer spending in order to get lower prices in the future. Instead of inducing savers to save less and spend more, NIRP causes savers to save more and spend less. It's a perfect example of the law of unintended consequences. When abstract academic theories are applied in the real world by central bankers with no real-world experience, you get the opposite result of what's intended. These unintended consequences have already appeared in Japan and Europe. Serious doubt has been cast on the ability of central bankers to extend NIRP beyond current levels. Banning cash would make those plans much easier to implement. One solution to negative interest rates is to buy physical gold. But governments always use money laundering, drug dealing and terrorism as an excuse to keep tabs on honest citizens and deprive them of the ability to use money alternatives such as physical cash and gold. When you start to see news articles about criminals using gold instead of cash, that's a stalking horse for government regulation of gold. Guess what? An article on the topic or criminals using gold appeared this spring, in Bloomberg. This is one more reason to get your physical gold now, while you still can. As if inflation, confiscation, and negative rates weren't enough, the global elites are coordinating a new plan for global taxation. As usual, there's a technical name for global taxation so non-elites won't understand the plan. It's called base erosion and profit shifting, or "BEPS." The BEPS project is being handled by the OECD and the G-20, with the IMF contributing technical support. If you're interested in BEPS, there's an entire website devoted to the global taxation plans and timetables. The website is worth a look. To paraphrase that famous line attributed to Trotsky, "You may not be interested in BEPS, but BEPS is interested in you." The global elite plan doesn't stop there. There's also the climate change agenda led by the United Nations. This agenda goes by the name United Nations Framework Convention on Climate Change (UNFCCC). The science of climate change is a sticky topic, but we don't have to dive into it for our purposes. It's enough to know that climate change is a convenient platform for world money and world taxation. That's because climate change does not respect national borders. If you have a global problem, then you can justify global solutions. A global tax plan to pay for global climate change infrastructure with world money is the end game. Don't think that climate change is unrelated to the international monetary system. Christine Lagarde almost never gives a speech on finance without mentioning climate change. The same is true for other monetary elites. They know that climate change is their path to global financial control. That's the global elite plan. World money, world inflation and world taxation, with the IMF as the central bank of the world, and the G-20 Leaders as the Board of Directors. None of this is secret. It's all hiding in plain sight. The papers, articles and links above give you the resources you need to learn more. This will be playing out in the next few years. Ed. note: "A charmingly mordant take on the stock news of the day, accentuated by philosophical maunderings…" That's how one leading financial magazine described the free daily email edition of The Daily Reckoning. You'll find cutting-edge analysis from the complex worlds of finance, politics and culture. Presented in an entertaining style few can match. Click here now to sign up for FREE. The post How Governments Can Kill Cash appeared first on Daily Reckoning. A federal appeals court on Monday said a cache of exceptionally rare gold coins stolen from the U.S. Mint in the 1930s belongs to the U.S. government, not the Pennsylvania family that possessed it for decades. By a 9-3 vote, the 3rd U.S. Circuit Court of Appeals in Philadelphia said Joan Langbord and her sons Roy and David cannot keep the 10 "double eagle" 1933 $20 gold pieces, estimated to be worth several million dollars each. Monday's decision could end a decade-long battle that began after the Langbords, heirs to late Philadelphia jeweler Israel Switt, found the coins in a safe deposit box and asked the Mint to authenticate them, only to have them seized in 2004. I read that I can’t eat gold as I munched on my 401(k) sandwich and guzzled my IRA wine, which tastes like a cheap Chardonnay. For a side dish I ate blanched twenty dollar bills and consumed a chocolate money market for dessert. Yes, I am kidding. The point is that simple statements such as “You can’t eat gold” are a useless DISTRACTION. -- is interviewed today by Lars Schall for Matterhorn Asset Management's Gold Switzerland Internet site, explaining why he believes "gold is back" and why the criticism of gold for not paying interest is supremely stupid. Stoeferle also praises GATA's work, asserting that complaints of market manipulation are not mere "conspiracy theory" but fact. The price of gold appears set to continue on a bullish run with gold futures pointing to a near-term target of about $1,400 while the long-term target could see the prices rise to new multi-year highs in the range of $1,500-$1,600 an ounce. Last week, FOMC took the more reasonable option of failing to announce another US interest rate hike despite a strong nonfarm payrolls figure of 287,000 new jobs compared to just 11,000 in June. "Job gains were strong in June following weak growth in May," the FOMC said in its post-meeting statement, adding that "On balance, payrolls and other labor market indicators point to some increase in labor utilization in recent months." This post The Oil Bull is Dead. Here’s What Happens Next… appeared first on Daily Reckoning. July was a month of epic market comebacks across the globe. 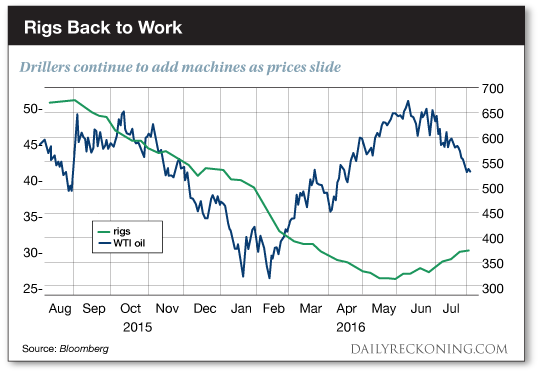 As the major averages dance with the bulls, oil finds itself in a new bear market. Crude slipped to its biggest monthly decline in a year, dropping 14% after briefly topping $50 a barrel. It's now more than 20% off its June highs after toppling another 3.7% to start the week. Pick your narrative. No matter where you look, oil news is bleak. Bloomberg reports that fuel stockpiles are at their highest seasonal level in at least 20 years. Baker Hughes data shows drillers added to the number of active rigs for the fifth straight week— which should help add to the oil glut as we approach the end of summer. "As the uncertainty of Brexit and Fed hawkishness worsen the macroeconomic picture, observers should say goodbye to prospects of industrial led demand growth," writes Barclays’ Michael Cohen. "The hope for a clear rebalancing may have to wait a couple more months, since oil's drain is clogged in the meantime." Sure, that sounds pretty bearish. 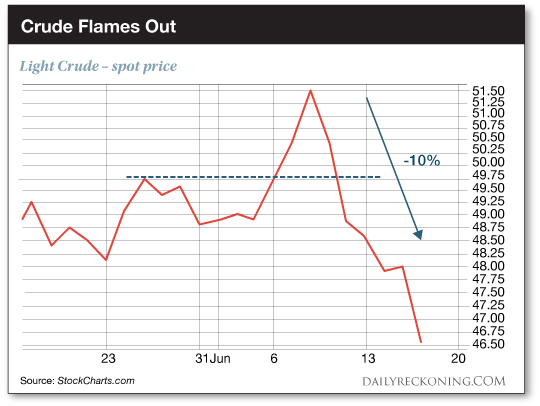 But if there is a clog, then how the heck is crude's spot price running down the drain? We warned you that crude's short-lived jaunt above $51 was a warning sign for the oil comeback all the way back on June 17th. Crude only had a few hours to savor life above $51 before everything started to fall apart. Despite a strong move higher, oil couldn't even hold a fraction of its gains. It's breakout to 11-month highs failed almost immediately. Now we know how the story ends. The failed breakout and subsequent breakdown officially signals the end of oil's ferocious rally that began all the way back in February—the same rally that helped spur stocks higher off their 2016 lows. Of course, the bearish action in crude is starting to rattle throughout the entire energy sector. The Energy Select Sector SPDR (NYSE:XLE) is starting to roll over, dropping by more than 3% on Monday. That puts it within spitting distance of its June lows—and well below its 50-day moving average. While the big oil companies took one on the chin yesterday, it was the independent oil & gas companies that were hit the hardest. No less than 35 indy oil stocks were down by 5% or more on Monday afternoon. Oil is enjoying an oversold rally this morning. It's up more than 1% as I type. Just don't expect black gold to start glittering again. The 2016 oil rally is officially dead. Lower crude prices are in our future. P.S. Profit from epic comebacks — sign up for my Rude Awakening e-letter, for FREE, right here. Stop missing out on the next big trend. Click here now to sign up for FREE. The post The Oil Bull is Dead. Here’s What Happens Next… appeared first on Daily Reckoning. Bullion Star's solution for storing bullion in Singapore is called My Vault Storage. With My Vault Storage you can store bullion in Bullion Star's bullion vault, which is integrated with Bullion Star's shop and showroom, making it a convenient one-stop-shop for precious metals in Singapore. Customers can buy, store, sell, or request physical withdrawal of their bullion through My Vault Storage® online around the clock. Storage is FREE until 2016 and will have the most competitive rates in the industry thereafter. On behalf of Matterhorn Asset Management, Lars Schall spoke with Ronald Stoeferle who is Austrian as well as an advocate of the Austrian School of Economics. This Great Graphic, created on Bloomberg, depicts the Federal Reserve's real broad trade-weighted index of the dollar. Real means that it is adjusted for inflation differentials. Broad means that it covers a wide number of US partners. Gold and silver prices rose as Asian and European stock markets fell on Tuesday, with gold touching 3-week highs at $1360 per ounce as major government bond prices also fell, driving borrowing yields higher from their recent new record lows.